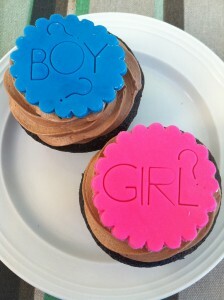 Trying to guess whether you’re going to have a boy or a girl can be fun, at times. There are plenty of myths and old wives’ tales that can keep you busy and guessing for hours on end. Every one of these tests and guessing methods is accurate – half of the time. Carrying position. This method of baby gender prediction says that if you’re carrying your baby low in the belly, you’re going to have a girl. If it’s high, it’s a boy. It’s false, of course; where you carry your baby is based on your muscles, your baby’s position, the shape of your body, and the amount of pregnancy weight you gain. Heart rate. Repeated studies have shown that there is no difference in fetal heart rate that’s based on gender – at least during early pregnancy. There is a single study that suggests that a female heart rate will beat faster than a male’s heart rate after 30 weeks of pregnancy, but this data hasn’t been confirmed via additional research. Swinging your ring. This one is a fun one to do at a baby shower, but there is obviously no science involved here. You’re supposed to hang your wedding ring from a strand of hair graciously donated by the baby’s father. If the ring rocks back and forth, it’s a boy. If it moves in a circular motion, it’s a girl. Drano. This one isn’t only unscientific, it can be dangerous. Variations of this one exist. The idea is to stir a sample of your urine into some Drano. If the mix turns green in color, you’re going to have a boy. Drano is a caustic chemical, however, and not particularly safe to breathe during pregnancy. Avoid this one if you can. Craving sweets. The idea here is that if you crave sweets during pregnancy, you’re going to have a boy. Crave sour foods, and it’s going to be a girl. The truth is that if you’re craving anything at all, it has to do with changing hormones and/or a greater sense of smell that exists during pregnancy. While some of these are fun, there’s no real scientific proof that any of them work. Your best bet s to see what the ultrasound says at 18-20 weeks.